This is perhaps an appropriate shot for the last entry from this year’s trip to Acadia. 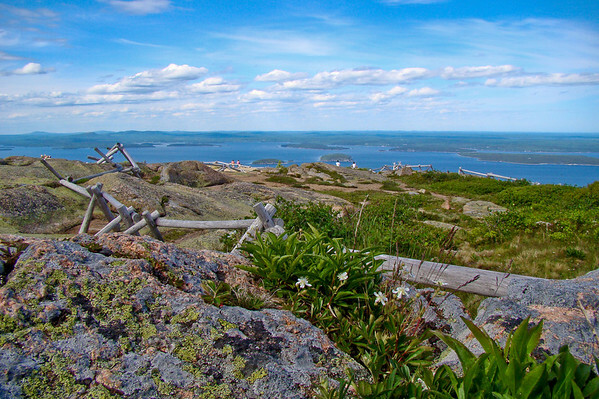 I tried several before getting this low angle, flower and lichen in the foreground, expanse of the rocky top and ziz zag of the environmental fencing, and then leaping out across Frenchman’s bay to the horizon with its clouds. I was trying to capture at least one aspect of Cadillac and Acadia: the sense of being suspended, all life, from the flower struggling against odds to the humans tiny on the near horizon, between the rocky, gritty particular and an awesome infinity. For me, that is an essential element of the Acadia experience. Practically speaking, I used Program Shift (see In Praise of Program Shift on Point and Shoot Landscape) to get the smallest aperture for greatest depth of field to keep everything from the foreground rock detail and the flower petals to the far horizon relatively sharp. It took me quite a few shots and 20 minutes to find the right flower. F8 on a P&S is pretty deep focus, but I found that I had to put the flower up into the field a bit and let some of the rock go soft right at the bottom of the frame. I cropped out the out of focus area in Lightroom during post processing. Sony DSC H50 at full wide and macro. F8.0 @ 1/200th @ ISO 100. Programed auto, program shifted for smallest aperture. In Lightroom, besides the crop, Recovery for the sky, some Fill Light and added Contrast to compensate in the foreground, added Clarity and Vibrance, and Landscape sharpen preset. Very beautiful I always look forward to see your pic of the day! A very nice trip, full of opportunity for image captures. As always, very well done.